Dubai, UAE: 12 October 2017: LG Electronics (LG) announced its official “Techorator” winners of the first-ever Signage Design competition for innovative professional designers and architects across the region at the Grand Hyatt in Dubai. Four winners have collectively taken home a total prize of US $100,000 across four categories worth US $25,000 each. The four winning designers have pushed the boundaries of artistic designs within new and existing commercial spaces using cutting-edge LG digital signage. The recipient of the OLED Signage Design Award, wherein contestants had to use the Open Frame OLED signage to create an inspiring display design for any space, is Mr. Madhur Viyas of Ontime Group. Mr. Shabab Kizhisseri of Pixcom Technologies, is the winner of the Ultra Stretch Signage Design Award that uses the 86-inch and 88-inch Ultra Stretch in artistic ways to create an immersive experience. The Dubai Dream Signage Design Award, where contestants were tasked in creating a Dubai-inspired design using the displays, was awarded to Roshni Nagpal of Shaoob firm. And the Vertical Vision Signage Design Award where designers were tasked to use LG displays to design a vertical space of their choice was awarded to Mr. Mazen El Mahmoud of COX Architects. “The future of signage rests in digital, and our findings indicate that this region is no different. With LG’s pioneering innovation in the signage industry, working closely with the most creative minds of the regional market, we are able to demonstrate endless possibilities where inanimate commercial spaces come to life. The LG Signage Design Competition is an example LG has set for the market where creative design and cutting edge visual display hardware have brought the best to commercial space – and the results from the winning entries of which we are extremely proud, speak for themselves,” said Kevin Cha, President, LG Electronics, Middle East and Africa. 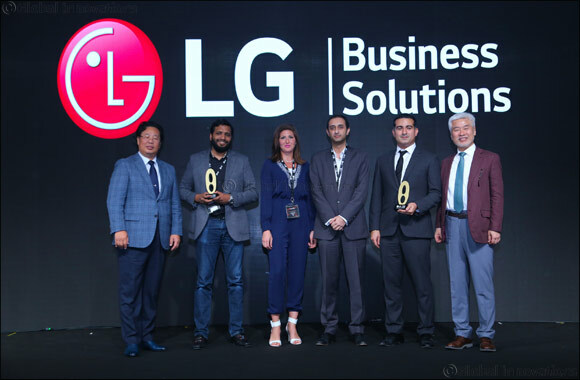 The LG Signage Design competition kicked-off earlier this year in April at the LG Signage Design Summit in Dubai, UAE where LG launched its latest information display solutions including LG’s Flexible Open Frame OLED and LG’s 88-inch Ultra Stretch digital display. The LG Signage Design Summit brought together renowned interior designers, architects, consultants and experience creators to learn about the competition as well as experience LG’s pioneering display technologies so that they could put their creative minds to work by combining their creative design skills and the complexity of display technology. Participants in the competition were able to highlight their creative concepts that integrate the flexible, pencil-thin design of OLED signage and the extended wide format (58:9 Bar-type) of the Ultra Stretch displays into functional display applications at various commercial environments. The LG Signage Design Competition’s judging panel included: Kang-Heui Cha, Head of Home Entertainment Design Lab at LG Electronics; Janus Rostock, Regional Design Director at WS Atkins & Partners Overseas (Middle East & India); John Bricker, Creative Director and Principal (New York) at Gensler; Steven Charlton, Principal, Managing Director at Perkins+Will; and Patrick Bean, Design Director Interior at Lacasa. “We are extremely pleased with all the submissions we received for the LG Signage Design Competition. With such new and innovative technology set to take over the future of signage in the region, it was important for us to encourage designers in the region and get the creative community involved and thinking about how digital signage could be incorporated into commercial spaces,” said Mr. Kyuchan Her, B2B Director, LG Electronics, Middle East & Africa.